I’m a huge fan of Disney films (and I’m also quite a critic of them), so when Disney announced their next project way back when—Frozen—I immediately found myself opposed to the movie. It struck me as uninspired (from the very title. I mean, no one thought of anything more original than Frozen? That and it sounds too similar to Tangled), and I scrutinized everything about the production. And in retrospect, I did so unfairly. The promotional material was juvenile, but so was Tangled’s. And I love that movie. After a while, I opened my heart up to the film, and decided to see it. And I’m glad I did. The film begins with two princesses—sisters Anna (Kristen Bell) and Elsa (Idina Menzel)—who spend their youths playing and enjoying one another’s company. Specifically by utilizing the latter’s magical ice powers, which she was born with. 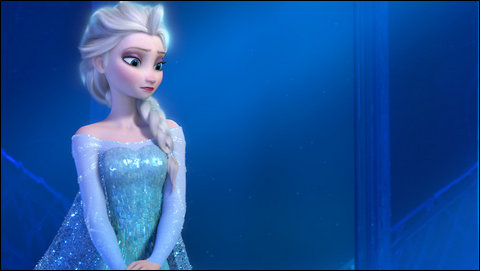 However, their lives quickly become solemn and isolated when Elsa accidentally freezes Anna (the injury is inflicted to her head, and notably not her heart—which would have been a more grievous act), and consequently, is isolated from the world by her parents until she learns to master her powers. The parents soon thereafter die, and years later, Elsa is coroneted as queen… until her powers resurface and in her fear, she flees the kingdom and triggers an eternal winter. Anna takes it upon herself to embark on a quest to bring her sister back, accompanied by ice harvester, Kristoff (Jonathan Groff). Frozen is a movie that both struggles to find its own identity, and at the same time is empowered by subverting the films one can’t help but compare it to. The dynamic between Anna and Kristoff is one that people will find perhaps unimpressively similar to that of Rapunzel and Flynn’s from Tangled (I promise I don’t mean to bring this film up so much), but the film isn’t truly harmed by this because romance isn’t the focus here. The film plays with common Disney tropes such the “true love’s kiss”, and “marriage after one day”, and rather than simply poke fun at them, they deconstruct them in ways that differ even from past Disney self-parodies. Heck, even the comedic relief in the form of Olaf the Snowman (Josh Gad) is endearing and handled appropriately as far as tone’s concerned. Without spoiling—Disney sets up your expectations and then impressively undermines your preconceptions. Few characters are as predictable as they would seem. I can confidently say that for one, Elsa is easily one of my all time favorite Disney characters. Having said this, the movie is hurt when it actually does fail to deviate too far from the classic formula. A forgivable peccadillo, sure, but a notable one. The score here is a mixed bag. It boasts some impressive pieces, such as Do You Want to Build a Snowman, For the First Time in Forever, and Let it Go (even if it does sound a little to “radio”), but it also has some more forgettable (although not explicitly bad) pieces of little note. Setting aside the shortcomings (a mixed score, and just a bit too much familiarity), Frozen is a beautiful movie, both in theme and visuals. The models are delightfully expressive and the snowy white and icy scenery is breathtaking beautiful, while also taciturnly threatening. But really, the beauty here is derived from the themes of sisterly love and companionship vs. isolation. This is for girls what Brother Bear was for boys. Except, well, much better.